ROCK & ROLL! Morfa Bach update. 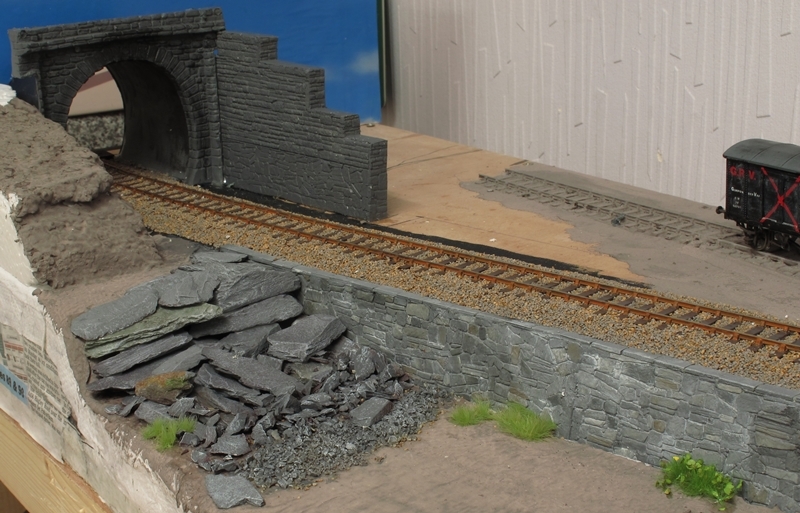 The spoil heap next to the tunnel portal has been made, glued, stuck down and painted. Some Mininatur grass clumps have been added. The remaining area has now received it's base of hanging basket liner. On the other (Viewing)side I've added some vegetation growing in the crack between the rock, just to break it up a bit. It's a pity that this view will not be seen by the viewing public but here it is anyway. 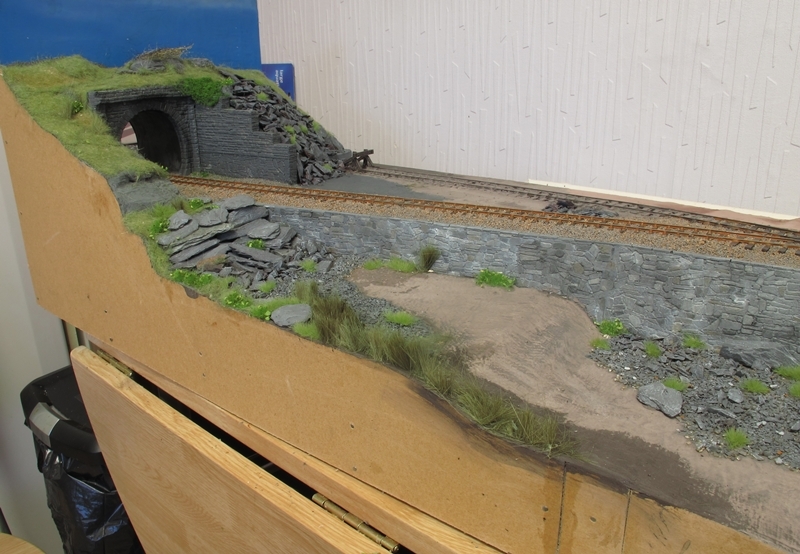 Here's another wide angle shot showing progress on the front of the layout with long grass, reeds and more scree. Please excuse the kitchen table! No other means of support exists yet! I've been itching for ages to take a picture like this. 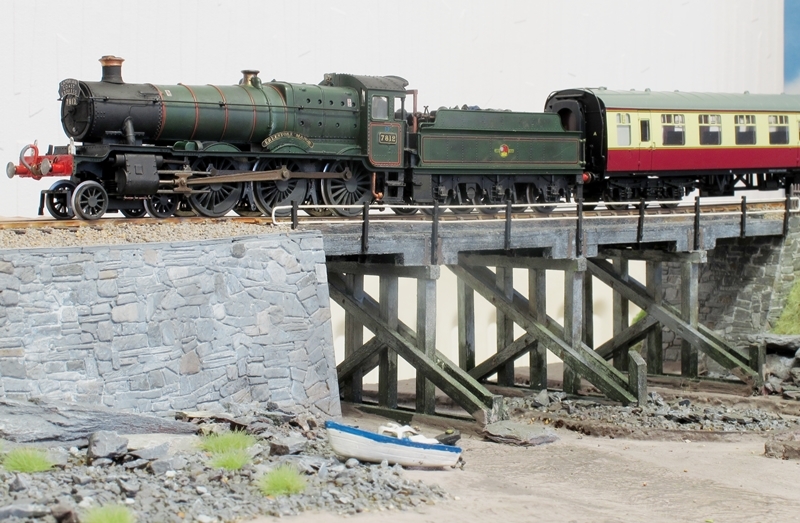 7812 Erlestoke Manor with the Down Cambrian Coast Express! Another quick but significant update. Finally I have got all the base scenic features in place. 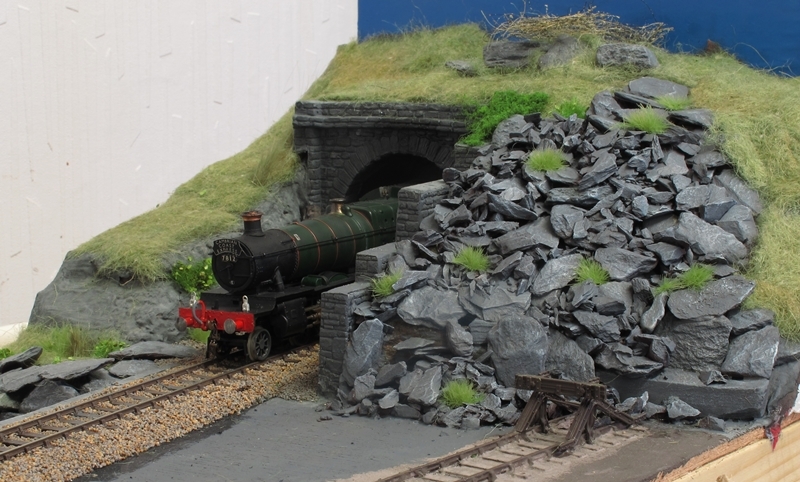 I have just finished the hillside around the tunnel mouth. Significant meaning that there will be (hopefully) no more polystyrene balls floating round SWMBO's kitchen! The whole lot being given a few coats of "Gloop of a different colour"! This time matt black emulsion being mixed with white filler to give me that grey granite/slate colour. A fair bit of this will be covered with the ubiquitous hanging basket liner, grass and vegetation of one sort or another as well as more real rock. Here's an overall view of Morfa Bach from the viewing side. Still lots to do and a deadline of April 22nd to meet! Must crack on and update again soon. Another week has flown by and it's time for the weekly update on Morfa Bach. 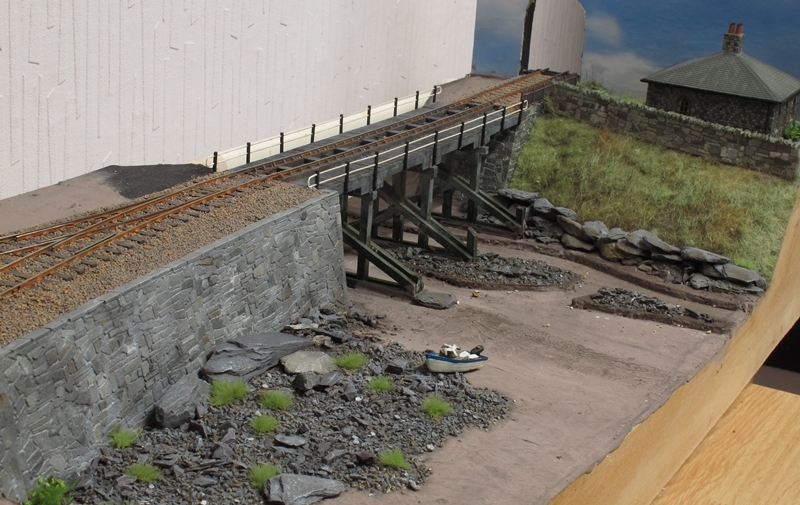 Progress on the scenery at the bridge end of the layout, Hanging basket liner covers the east bank of the river and some rocks and scree have been fixed to the west bank area.A small boat salvaged from an old layout has found a new home too! 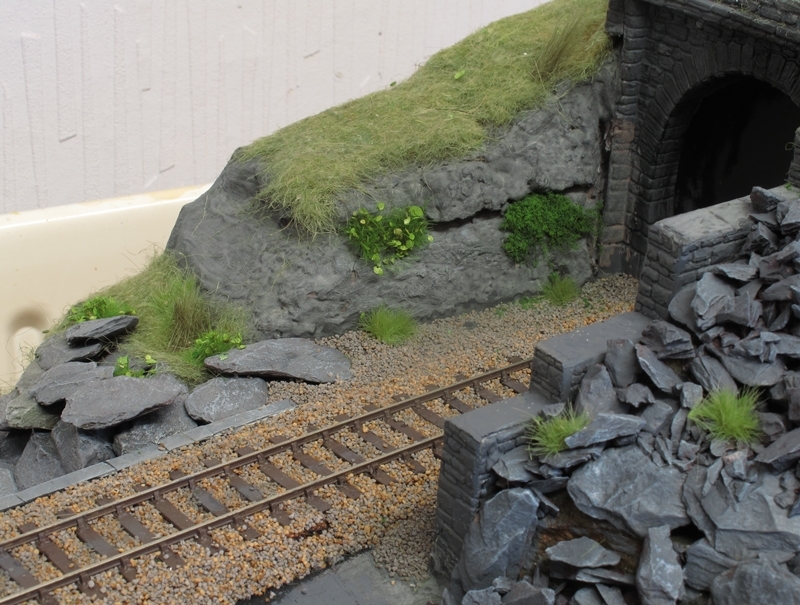 A start has been made on adding some rocks and scree up the slope to track level. 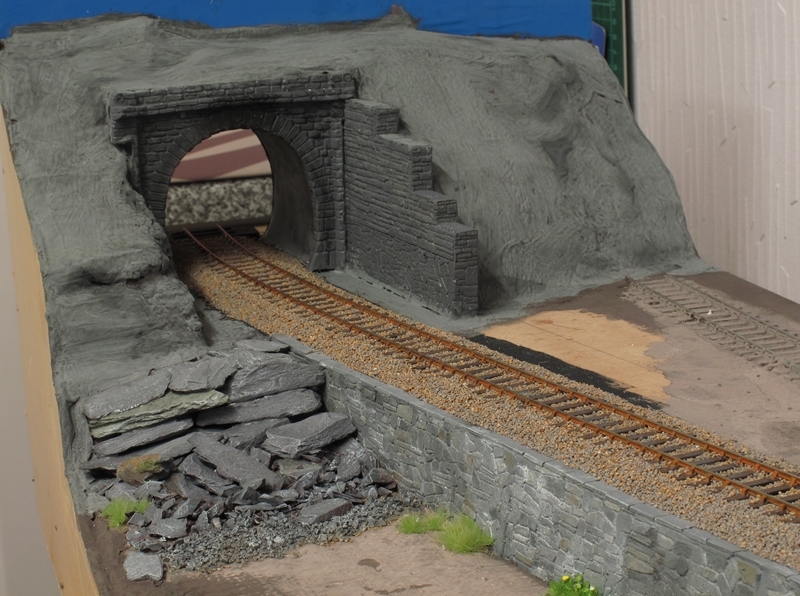 The tunnel is fixed in place and the new retaining wall made and fitted to the right hand side of the tunnel portal. Still have loads to do at this end. I'm waiting on delivery of some static grass fibres to create the salt marsh. Hopefully it will be here before the next update. There are other jobs to be done if it doesn't get here in time anyway so another update in about a week.